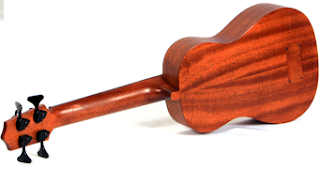 I have reviewed quite a few Kala ukuleles on my blog, and overall I have been very happy with their products, and they are a first-rate manufacturer in the uke world. 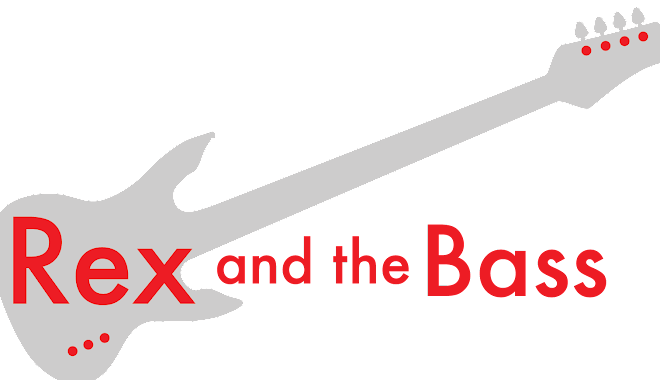 So, it should not be much of a surprise that I also like one of their weirder, products: the U-Bass. I first saw the Kala U-Bass at Bass Player Live a few years ago, and my first impression was that it was a toy or a gimmick, but after I played one for a while I changed my tune. This is a fun and easy to play instrument that also happens to sound very good. The U-Bass is about the size of a baritone ukulele, so it has a scale length of 21-inches, which is a bit different than the usual 34-inch scale you will find on many traditional electric basses. The neck, body and top of this one are made of solid mahogany. Except for the inlay on the headstock it is relatively plain-looking, with a matte finish and no binding. You can also get these instruments with a solid acacia body or with a spruce top and mahogany back and sides, but the mahogany one is the best looking one (in my opinion). The bridge and fretboard are both hewn from nice-looking rosewood. These basses are also available in fretless models, but with a scale that short there was no way I was going to spring for one of those. You might be up for the challenge, though. And, it comes in a nice semi-hard foam case, that appears to be a little long for most airlines’ carry-on luggage size requirements, but they will probably let you bring it on anyway. People bring all kinds of huge crap on the plane with them, it seems. The only gripes I have are negligible. It is too plain-looking, and I would love to see tortoise binding and chrome tuners like my other Kala ukuleles have. I miss having a strap pin too, but since ukuleles do not usually come with strap pins I will let that one slide. The list price for a Kala U-Bass is $660, with a street price of $550 which is steep when compared to similar quality baritone ukuleles, but this one will do a lot more than any of those one-trick ponies. The spruce top model is about $100 cheaper, by the way. Come to think of it, you can get a decent used Precision Bass for that kind of money too. Hmmm.